As mentioned a couple of blog posts ago, we had secured an amazing camping pitch overlooking the sea and beaches below our campsite, Cala Llevado in Spain. We were positioned right at the end of the upper terrace with pitches below us gradually descending down the cliff. There was no danger of our view being obscured by the arrival of another motorhome because the small terrace next to ours wasn't a pitch - it was access to a small path. We quickly discovered that with all the pitches with views taken, new arrivals were eyeing up this non pitch and it wasn't long before a family maneuvered their van into the space. Taking no chances they'd stay there Tony was quick on his feet telling the driver, as he emerged from the front seat, that that was not a camping pitch. 'It's a corridor,' I explained, hoping the French for corridor was similar. While sitting in the evening sun and cooking our dinner by the spectacular views afforded by our camping pitch at Cala Llevado in Spain a Swiss lady stopped to chat to us. I think my jaw nearly hit the floor. We'd discover later that the lady and her husband were in a tent on probably the best positioned pitch on all of the campsite with a complete panoramic view of the sea and Cala Llevado's many beaches. That one-year-old video has been watched 1,700 times. I wonder how many other people have based their decision to book a campsite because of this blog? I ought to get a commission! We arrived at Camping Cala Llevado at just gone midday, having first stopped at a Lidl supermarket to take on supplies. At reception we were offered pitch D7, presented with a map and asked to have a look at the pitch and determine if we liked it, or find another we preferred before returning to complete the paperwork. Pitch D7 is the last pitch on a gently sloping terrace and has a corner plot with perfect views of the sea and beaches below. The previous year we'd had a pitch in the middle of the terrace and just a sliver of a sea view so we were delighted with the pitch on offer. I left Tony setting up for our five-night stay while I returned to complete the paperwork. The booking was fully paid when I completed it online the previous day and so all that was needed was for the receptionist to issue a receipt. Sometimes you just discover a campsite a little out of the ordinary. We stumbled upon Casa Valerosa nestled in the Spanish mountains, not far from the coast while looking at Google Maps. The weather forecast showed maximum sun potential in the area but none of the coastal campsites appealed to us. Then I spotted this eco campsite that ticked all the boxes. I fired off an email to ask if Casa Valerosa could accommodate our arrival the next day and received a reply within a couple of hours. It was only an hour and a half's drive from Lake Caspe where we'd spent the previous three nights. A supermarket stop at Lidl delayed our arrival a little but we still arrived very early, at 11.30am. No matter our early arrival though - we were welcomed and shown around the mountainous landscape and allowed to choose our preferred pitch. Our loose plans for our holiday quickly came unravelled. We spent the second and third nights as intended at a campsite just outside Poitiers. We didn't think that through properly since the full day we have ourselves to look around the town was Sunday when everything was closed, including an amazing looking board game shop. 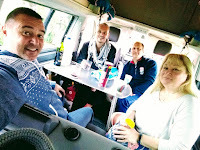 However the highlight of staying here was that our friends Jules and Pete were able to coordinate a night camping with us on their own way down to Spain. From Poitiers we were going to travel down France's west coast and have a night at the Pilat Dune and then three nights in the Pyrenees. Weather forecasts had us rethink. The west coast of France was due for rain and the Pyrenees were just going to be cold. 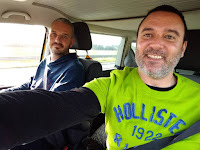 We decided to have a day of travelling and set off for Lake Caspe in Spain, eight hours away. What to do with 17 nights in a campervan in April? Trying to avoid the UK's April showers would be a priority. If we could find warmer weather it would be nice and so we decided to head for northern Spain again. With the ultimate aim of spending a week on the Costa Brava we'd be in no rush to get there and could take our time, driving manageable chunks, and stopping at interesting places, some new to us, like Poitiers and the Pyrenees, and taking the opportunity to spend a little longer at the Dune du Pilat. We were booked on a 9.20pm Eurotunnel train. I'd finish work at 1.30pm and Tony at 3.30. I use the campervan as my work vehicle, driving between the homes of the dogs I walk so I'd have two hours to turn it from the Bark Bus to Cleopatra Campervan. My last two dogs of the day added to my list of jobs when one decided to pee on my canvas hiking shoes - washing and drying a pair of shoes hadn't been on my to-do list. February is a difficult holiday for sun-worshipping Brits who travel by campervan. We only have a week and so there's not enough time to drive to the warmer weather in Spain. We decided instead that we'd have a lakes or mountains break with hiking and biking whatever the weather. Our morning homeward-bound departure shaped our plans for the end of the holiday - we're going to spend the last couple of nights in Bruges. It kind of made sense to base our first five nights in the same kind of direction, hence our first camping trip to Luxemburg. 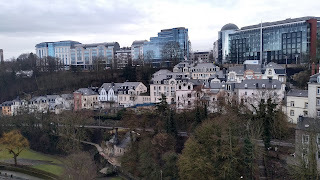 Until now Luxemburg has been that country you go through to get to Germany and we've only seen it from the motorway. But PitchUp uncovered several promising campsites and we've picked one in the northern tip of the country next to a canal and forest. For the second time this year we let the weather determine our holiday destination for our October getaway. While Bavaria had been our initial plan, nearer to departure the long-range forecast had us rethink and focus on southern France. It was also the second time this year we mixed up our Eurotunnel booking. Two weeks prior to our holiday I went to check the time of our crossing, discovering in horror that we were departing from Calais instead of Folkestone. Again! You'd have thought the last time it happened we'd have checked the remaining bookings. Fortunately Tony was able to get it sorted out the next morning, getting our incorrect booking cancelled and, by some miracle, organising two reasonably timed crossings out and back in.